About: Galicia Restaurant is a tapas bar located in wonderfully basic surroundings, popular with Spaniards and locals alike. Booking is advised, especially on the weekend. Catering for private parties of up to 30 guests is available upon request. Galicia is a great restaurant with lovely food and wine and nice staff with a very welcoming and efficient manager Alvaro. Not to be missed. I won't go there again because of the service of the waiters. They were ignoring me and my girl for almost one entire hour once we were in our table!! I can understand you can be busy but that is not my business. There is no excuse even when our dinner was 55 pounds for JUST TWO PEOPLE!! We like dinning in Spanish restaurants and I've never seen so expensive and normally we eat the same things wherever we go for something like £35. Surely the ratings on this page are from your friends but your service is actually the opposite than what I can read in some of these comments. A little bit of Spanish Heaven transported itself to Portobello. It's what's called 'a real find' and it makes you feel very happy to know it is there. Eat, drink, talk , watch and appreciate the hard work that goes into keeping it the way it is. Then say good afternoon, go home and siesta and come back for a delicious dinner with someone you enjoy. If only all places were like this. The food is genuinely some of the best I've had - the squid in ink is just gorgeous, garlic prawn etc just brilliant and the pulpo absolutely perfect. No poncey decor, silly presentation or obsequious service. Exactly like the places in Spain/Galicia but probably better, I just wish places like this that concentrated on food - no frills but top quality - were the norm. Wonderful. I have been going to this restaurant since 2001/2002 everytime i go in there i am greeted in a nice way by alvaro and the other staff there. I have never had any issues with the place the staff are always friendly and alvaro in particular likes to crack a joke or 2. The food here is always very well presented looks and tastes fresh and all at reasonable prices. Odd occasions where i havent been happy with the food it has been taken back and re-done for me no questions asked. They have a fine selection of wines which are very very good. Overall i would recommend the galicia restaurant to anybody who likes quality spanish tapas and main meals at reasonable prices. Galicia is a fantastic restaurant. The food is great and very authentic, but the service lets this place down. When this place is busy the waiters go into selfish mode, ignoring customers, making mistakes on orders, failing to correct orders, over charging, and worst of all not saying sorry and making things right. Ego is no way to run a restaurant. Good value food though. Galcia is one of the best resraurants iv'e ever been to in my life, most occasions me and my family go there. The food is real delicious. You are welcomed so well. If its someones birthday and you tell them, they will sing happy bithday to that person and give them a slice of cake.I would realy recommend this restaurant to everyone. We have been going here for over 2 years now about once a month or so. It is a homestyle, family run restaurant, so if you fancy modern, flash decor and will moan if you dont get it, then dont go. Frankly we dont care what kind of chair we sit on, after all its the food we are paying for and that we are there for. The food is delicious. We have basically tried everything at this stage, from tapas to mains. The wines are also very good and reasonable, especially the house Rioja. It is always busy and full of native Spanish. Yes there can be an air of chaos and there is one waiter there who seems to constantly be having a bad day but we just find him funny. Personally we prefer to order and to be served and after that we dont really want a cheesy waiter hanging from our table playing for tips. This place is great, believe me we would not keep going back if it wasnt. Give it a go. I've been coming to this restaurant for 25 years and have never been disappointed. The Gambas Ajilio are always superb! I'd be really intruiged to ask those people who gave this restaurant such appalling reviews to explain exactly what they were expecting from somewhere that quite clearly does 'exactly what it says on the tin.' 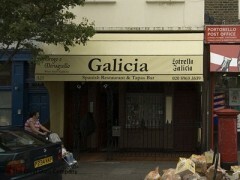 I went there on a Friday night with my Galician girlfriend and we were thrilled by its vim, vigour and vitality. The seafood tapas were straight from Billingsgate market, cooked perfectly and astonishingly well-priced; the wine was good value (for a Notting Hill eatery); the service was typically Spanish (i.e. efficient but with no strings attached); above all, the ambience was totally, authentically Galician and utterly refreshing. Go go go go go go go!